I hope everyone had a fantastic, best-ever Easter this year! We sure did! We went to Koala Park Sanctuary here in Sydney for Easter Sunday. I didn’t realize what this place actually was until we were inside – it is filled with Australian wildlife! If it’s an animal and if it’s Australian, it will be here. Koalas, kangaroos, emus, cassowaries, echidnas, wombats, dingoes, cockatoos, lorikeets, bats! The children enjoyed it, but my 5-year-old daughter had the best time of all of us because she was able to feed and pet the kangaroos. 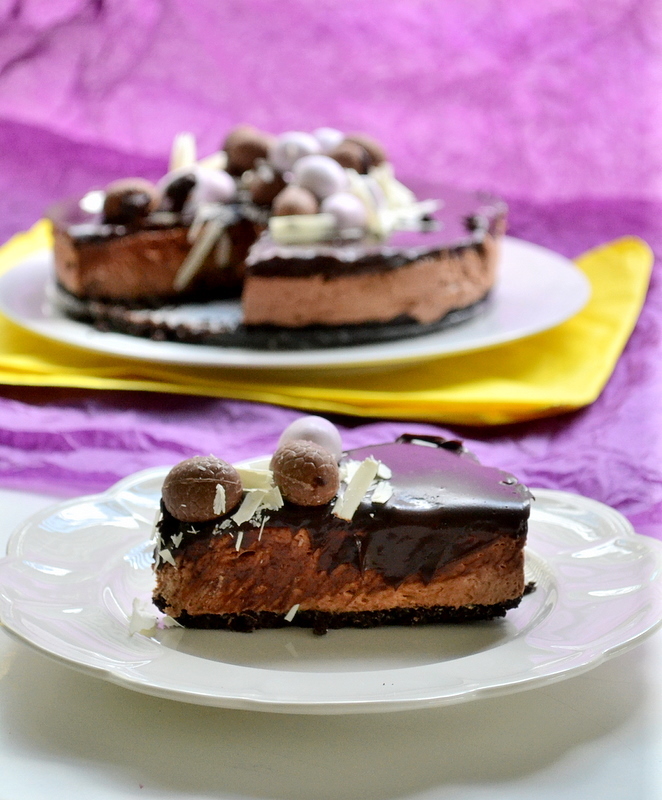 Now, earlier, I had made this Easter-themed chocolate mousse cake, but it was way too rich. So rich, in fact, that I couldn’t even finish a slice of it. It was very delicious, but basically inedible, in my opinion. And then came Easter and we found ourselves up to our bunny ears with chocolate bunnies and chocolate eggs. That’s why I haven’t updated here very much, because I haven’t been baking anything sweet as we still have a bowl full of leftover bunnies and eggs! 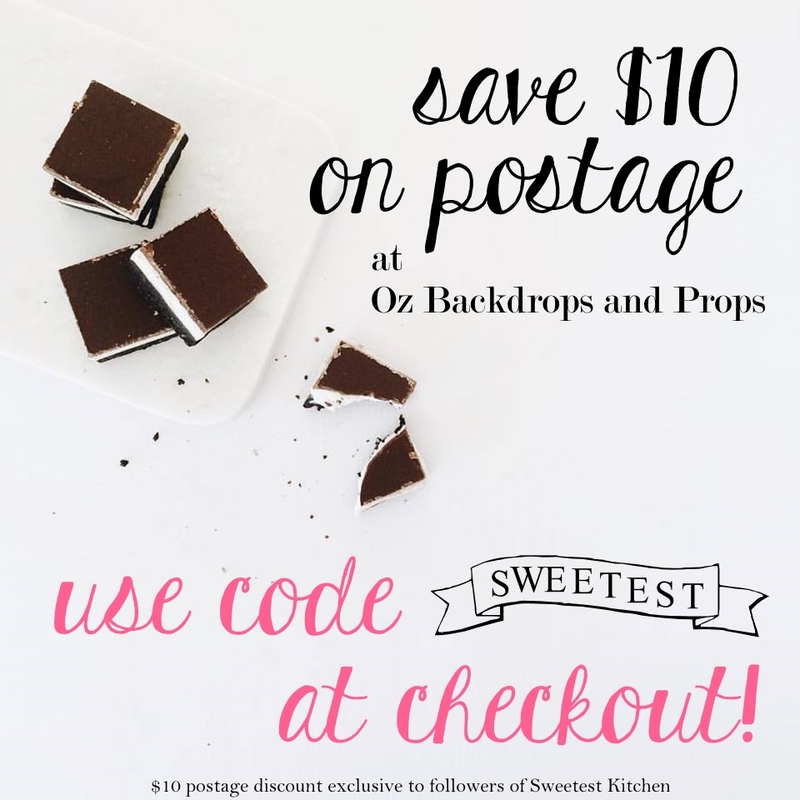 Therefore, I am not going to give you a sweet recipe today. I am going to give you a delicious, savory one for a flavorful chicken dish. It was one of the first recipes that really stuck out at me from Jamie Oliver’s new book 30 Minute Meals. I’m not normally a fan of Jamie Oliver’s, but the concept of the book was neat enough to get me to buy it. I’d take Jamie Oliver’s 30 minute meals over Rachel Ray’s 30 minute meals any day! So what exactly is this flavorful chicken dish that I speak of so highly? Let me show you. Okay, so yes, it has that messy Jamie-Oliver rustic look to it, but this mingling of flavors is a lovely one. First, the raw chicken is rubbed in a mixture of olive oil, salt, pepper, dried oregano and sweet paprika (Jamie doesn’t give exact amounts for the spices, but in the recipe below, I tried to give you an estimated idea as to the amounts I used). The chicken is then fried until golden. It is then added to a roasting tray with a quartered lemon, tomatoes, rosemary and bacon, then the whole thing is placed under a grill until the chicken is cooked through. In Jamie’s book, he serves this chicken with spinach and potatoes, but I served it with buttered and salted peas. Chicken, Because We're Sick Of Chocolate! 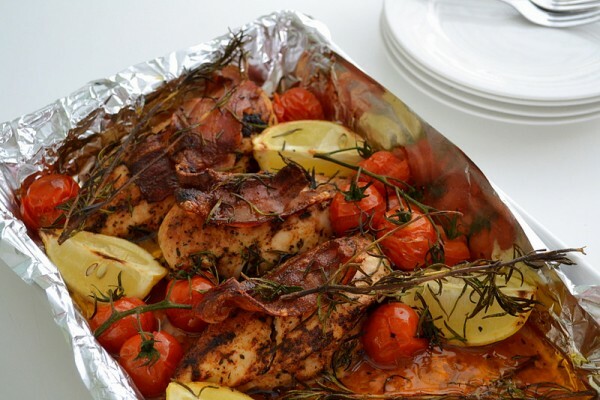 A delicious meal from Jamie Oliver with chicken, bacon, tomatoes and rosemary. Heat a frying pan to high. On a sheet of baking paper, sprinkle over the oregano and paprika, and season with sea salt flakes and freshly ground black pepper. Drizzle over 2 tablespoons of the olive oil, and add 1 tablespoon of the olive oil, along with the butter, to the frying pan. Lay the chicken on top of the baking paper, then rub them all over in the spices. Place the chicken in the hot frying pan and fry until golden on both sides, about 4 to 5 minutes. Remove the pan from the heat and stick in the rosemary sprigs to give them a good coating of the juices, then take them out and set aside for a moment. Meanwhile, preheat the grill in your oven to high. Remove chicken from the frying pan and arrange it in a roasting tray (add any juices from the frying pan, as well) with lemon quarters and tomatoes. Lay a slice of bacon on top of each chicken breast, then arrange the rosemary sprigs on top. Place the tray under the grill for at least 14 minutes, or until the chicken is cooked through. If you prefer, you could also bake this in the oven until the chicken is cooked, at a temperature around 375F, or 190C for about 20 minutes. I just saw this and wow, this is a very unique idea for Easter. I’ll definitely save this for net year!